This Magellan RoadMate GPS gives a bit extra. The Magellan 4.7" GPS is recognized as a free map update unit. Register your unit with Magellan's free Content Manager and you are entitled to one free map update. Redeem when your maps are older - a year or two years from purchase. A 4.7" screen gives you noticeably more map to view. Enjoy the larger screen size - a Magellan exclusive. 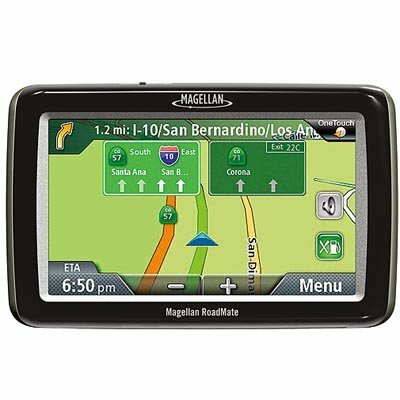 Magellan RoadMate 3120-MU 4.7" GPS Unit: •	4.7" touchscreen Presents information clearly and brightly for optimal navigation •	Highway Lane Assist Realistic highway signs point you in the right direction when approaching interchanges and exits •	Spoken Street Name Guidance Hear street names and directions from your Magellan 4.7" GPS •	QuickSpell with SmartCity Search Enter destinations with only a few touches •	Multi-destination routing Plan a trip with multiple stops in the order you want or will optimize it for the most efficient route •	6 million Points of Interest (POIs) Millions of destinations are searchable from the huge POI database •	Highway Exit POI Search Search for gas stations, restaurants, hotels and more near upcoming highway exits •	USB port Used to transfer data from a compatible PC to the GPS receiver for potential future software updates and installing custom POIs on compatible units. On some compatible products the USB port will also serve as a power plug when a compatible VPA (Vehicle Power Adapter) or AC wall adapter is connected to it. If you have any questions about this product by Magellan, contact us by completing and submitting the form below. If you are looking for a specif part number, please include it with your message.